I admire the celebrant who journals during the process of planning, hiring, delegating, dressing, marrying, partying, and honeymooning. Ultimately, there is very little time, lots of noise, and an enlisted army of talent to help make the memories one would put down to pen and paper stick in the minds of all who participate. In this way, it seems that journaling is not necessary or timely. In this way, live event painting is. Though the techniques and elements have evolved in movements and genres over the years, there has always been this form to bring our stories into works of art. In a painting, simple brushwork can show the power of the colors, the angle of a posture easily identifiable as a familiar friend, the energy and life of music, the texture of those big moments within. 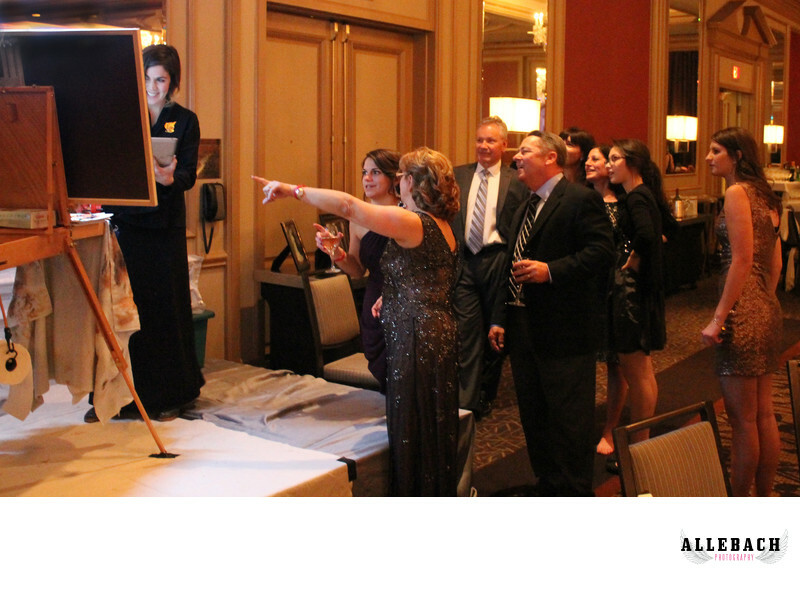 Live event painting, as it is referred to today, provides the staging of a sophisticated, patient, driven observer with guests standing by, as layer upon layer build from start to finish in one evening. Whether the desire of the most unique and tasteful element is sought to dazzle guests, or the wish to begin or continue a union of building an art collection that starts with a professional life-lasting oil is the goal, live event painting serves to build memories from the first brush stroke to the conversations evoked as this painting adorns a home. 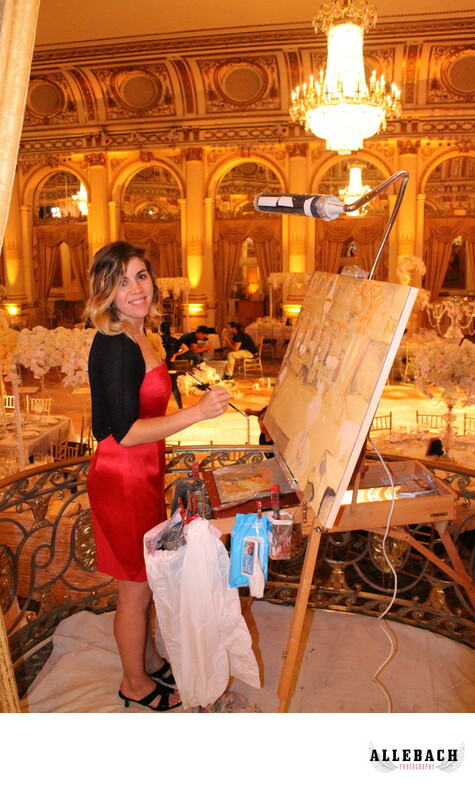 As a live event painter, I love sharing my training and eye filtered through my passion to connect and celebrate with incredible people. I love to bring the tradition dating back thousands of years into the contemporary affair. Unique to this newer form of painting, the personality of the artist is key in building the family that makes an event smooth, mind-blowing, and visionary. It is my honor to keep your diary for you and to tell your story in a way that words cannot possibly do, just as the greats urged us to understand. Andy Greenlee (born Andrea Rose Rampulla 21 November 1980, in Philadelphia, PA) is a Live Wedding and Event Painter noted for her vitality as a personality and as a fine artist. Her current practice and environment focuses on the oil paint medium on smooth surfaces of archival gesso and claybord. These works she creates in her studio and live, for celebrants at both private or public engagements. In her undergraduate studies both at Parsons School of Design (NYC) and Cornish College of the Arts (Seattle), Andy studied fashion, costume, and production design. She applied her vision and training and her passion for travel and new locale by becoming a member of the New Mexico IATSE film chapter where she worked on commercials, series, and film. On set, Andy mentored students in managing large scale productions from all aspects of design and set etiquette. In her newfound love of mentorship, she was compelled to pursue a Masters in Education at Kutztown University (PA), but after a few years of teaching was drawn back to the world of production, design, and fine art of her own making by developing Celebration Paintings. During this shift she also became the mother of two children; Ruby (5) and River (6). 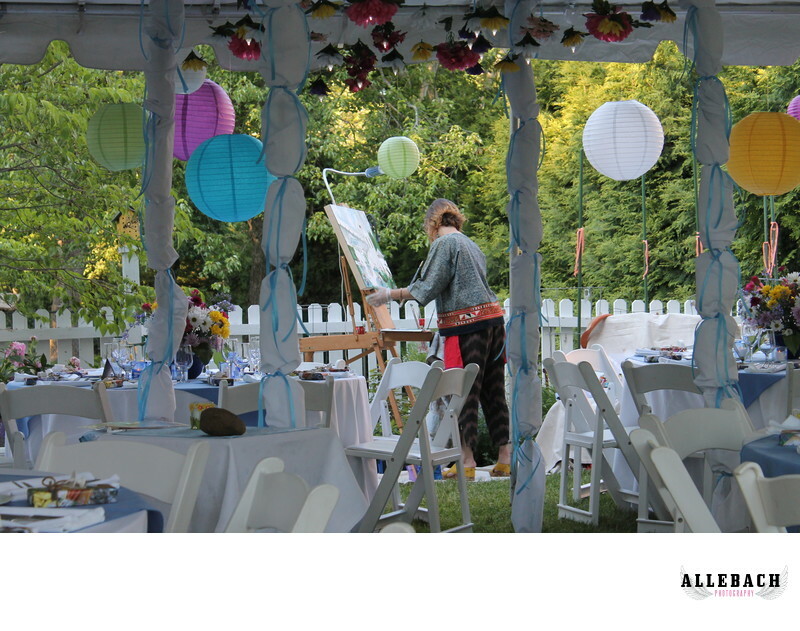 Andy draws from all of these experiences; costume and fashion design, fine arts foundations, film and theater industry work, education and motherhood, to give her a unique combination of skills as a live event and wedding painter. Her clients find her sense of humor to be balanced by devoted, focused professionalism and hard work, and they find her paintings and her style highly trained and special.